Update: Now you can choose to hide or display the quick editing tool by going into Blogger edit post options but do read about why you should keep the quick editing tool before you remove them. We have received numerous complaints of bloggers seeing those "irritating" quick editing icons - the pencil quick edit icon for the posts, and the screwdriver and wrench (spanner) quick editing icon for the Page Elements (widgets). Personally they don't irritate me at all. Further, they are only visible to me when I am logged into Blogger. No one else will see it. I have written about it before at How to get rid of the irritating "pencil" and "screwdriver and wrench (spanner)" quick edit icons (click BACK button to get back to this page). This however don't seem to satisfy some bloggers, especially those who have private blogs and can view their blogs only when they are logged in. "Okay 300 ducats to cooked art, his method worked. The other anwers are basically saying, 'Don't worry -- nobody who uses your blog will see these eyesores but you.' Which seems like an odd thing to tell me, since I will be using my blog more than anyone else, and I don't actually enjoy looking at eyesores any more than they would." Sign into Blogger (Dashboard), click SETTINGS for the relevant blog and you will be in the SETTINGS > BASIC sub-tab by default. Just a bit down from the top of the page, you will see "Show Quick Editing on your Blog?". Click the down arrow and select "No" At the bottom, click "Save Settings". (Warning: There is a button "Delete this blog" very near that "Save Settings" button, and it is not uncommon to hear of bloggers who accidentally deleted their blog this way). Once you have done that, you will never see the quick editing Pencil icon again. If you face difficulties finding that line of code, press ctrl+F and you will see a "Find" followed by a box for you to type or copy-paste what you want to find. Type or copy-paste the above line of code into the box and click "Next". The scroll bar will scroll down to the line and the line will be highlighted. Use your mouse to highlight that line of code again and press the DELETE key. Preview, and if you don't get any error message, click "Save Template". You will never see the "irritating" (to me, useful") screwdriver and wrench icons again. Update: A comment from a blogger which I myself haven't tested. Updating here in case any visitor interested in what he has to say. If you do try it, do give us some feedback by leaving a comment: "Sweet! I realized that the wrench icon was causing layout problems in IE7; I got rid following your instructions of it even though its pretty useful. In case if this helps anyone: the wrench icon is floated right. Float right inside divs that are already right floated will cause the div to stretch unnecessarily in IE7." (If you are only interested in how to disable right-click and you don't want to be bothered with all this arguments about why you should not do it, skip all this and go to the bottom of the post). This has been requested many times, but in my opinion and also the opinions of many others in the know, disabling right-click to prevent visitors from copying your photo is a very bad idea. To me, it is an exercise in futility. If you still want to do it, I will outline how I did it for this blog Right-click have been disabled for this blog. Note that in that post which contains a photo, you can't right-click on the photo. Before I show how to disable right-click, try clicking on the photo in Right-click have been disabled for this blog. You will be taken to a page with only the photo. Confirm that you can right-click on the image, select "Save image as" and copy the photo into your computer. You will be able to find the URL of the photo in the HTML. Just copy the URL and paste it into the address bar of a new tab with a browser like FireFox which has tabbed browsing. If you copy-paste the first URL (highlighted in red) into the address bar of the browser press ENTER and you will be taken to the page with the photo where you can right-click and copy the photo. If you copy-paste the second URL (highlighted in green) and press the ENTER key, you will get a "pop-up" to either open the image with a photo editor or a photo viewer, or save it into your computer. 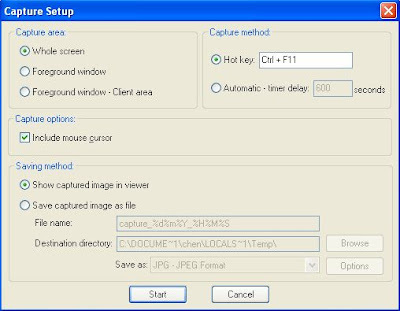 Another simple way is just to take a screenshot by pressing PRINTSCREEN, open up a photo editor like Irfanview (click BACK button to get back to this page), paste the screenshot into the photo editor window, crop the section you want if necessary, and save. Fashion Critic also left a comment stating you can also (my own addition: minimise the window so that the desktop is visible) and drag the picture into your desktop. I tested that at Right-click have been disabled for this blog and found that it worked. So I hope you are convinced that disabling the right-click will only inconvenient your visitors but wouldn't do much to help prevent those who want to copy your photos from doing so. A better way is to add a copyright notice to your photo as described in Put a copyright notice into your photo. More expansive photo editor like More expensive photo editors like Adobe Photoshop can also embed digital watermarks in images which are not visible, but can be detected electronically in case you need to take legal action. But tell me, how many bloggers are prepared to go to court over copyright infringements? But you do have the option to report the copyright infringement by report it to relevant parties by emailing abuse@google.com, abuse@blogger.com, etc., but whether action will be taken will be completely up to them. Disabling right-click will also cause great inconveniences to your visitors. I used FireFox browser with tabbed browsing and frequently right-click on a link and chose "open in new tab". I get very irritated when I can't do this. I have put two links at Right-click have been disabled for this blog. Try right-clicking on the links there and see what happens. I also often right-click on a link and select "copy link location" to copy the URL into clipboard, but I can't do that for the above blog. If you cannot stand your photo being copied, don't upload them to the web is my motto. Review, and if you don't get any error messages, save the template. Acknowledgement: This tip was adapted from Disable right-click on page. When Blogger in Draft (actually just a name for an experimental Blogger account where new features for Bloggers are introduced and tested), it just introduced 2 features - Autosave (Rat called this Auto####) and video upload direct from your Blogger post editor. They later introduced Polls and Enclosure links. As at time of publishing, Polls are still having problems and Enclosure links which allow you to turning your blog into a podcast easy. There is some controversy over Autosave (including 2 bloggers who complained that they like to play with editing of their old post and if they don't like it, they just don't publish. Now with Autosave, their old post get overwritten without their "permission". I also complained that while doing edition of old post, before I finish with the editing, the untidy, unfinished post get published. I have to add the phrase "under editing" at the top of the post to warn readers). I have been pestering Blogger to give bloggers an option to turn off Autosave in such circumstances, but for unknown reasons, this very reasonable request was turned down. Now Video Upload is out of beta (Blogger in Draft) and I am wondering if anyone will discover any similar problems. Now when you get into your Blogger post editor, you will see an extra video upload icon in addition to the other standard icons. The previous post Change blog title from all uppercase to all lowercase or vice-versa (click BACK button to get back to this page). This post will describe how to change a blog which has its blog title all in all uppercase to only the first alphabet of a word in uppercase, with the rest in lowercase. Preview, and if everything is OK, save the template. NOTE: Both the examples in the previous post Change blog title from all uppercase to all lowercase (click BACK button to get back to this page) and this post use New Blogger Minima template modified to 3 column by Hackosphere (click BACK button to get back to this page). If you are using a different template, the codes may be different or the particular lines may be missing altogether. If so, just add the necessary lines in. Feed is a way of getting updates on your website without having to visit it by subscribing to the feed either through an online feed reader or by subscribing to the feed via email. In practice, feed can be set to full or short. If set to short, the feed is supposed to display the first few lines, and if this attract the attention of the feed reader, then he/she will surf over to the actual site to read the full content. However, I have noticed that when I set my feed to short, in many cases, what is displayed is only the post title. So for it to be meaningful, you will have to use a very descriptive post title. But here is a bit of good news. Google has bought over Feedburner and have given bloggers the option "burning" their feed at Feedburner and then redirect your Blogger feed to Feedburner feed. The methods and the advantages will be explained in the section below. However, for this, you must set your feed to full, otherwise, you cannot use this feature. If you do podcast, tick the "I am a podcaster" box, otherwise just click "Next". Feedburner will identify the feed URL's for your blog. For blogger, there will be an Atom feed and a RSS feed. I would suggest the more popular RSS feed. I would also suggest you copy the feed URL's into a Notepad file and save it into your computer so you can retrive them when you need them. Tick this and click "Next". You can also chose to subscribe to feed by email. Previously, Blogger only offer Atom feed. Many have been hankering for the more popular RSS (Really Simple Syndication) feed, and in New Blogger, they have added RSS feed. You probably have come across the familiar icon or the less common button. Other common feed subscription button includes the "Add to Google Reader button , "Add to My Yahoo" button , "Add to Bloglines" button , "Add to Newsgator" button , and a whole lot more. and type in paste your blog URL. Click "Next" and Feedburner will look for available feed for your blog. For Blogger, there will be Atom and RSS. I normally chose RSS. Recently, Google have bought over the popular Feedburner and now you can integrate your Blogger feed with Feedburner. The advantage of doing this is that you can get statistics about your blog subscribers via Feedburner. Amanda of BloggerBuster have created a number of New Blogger templates. However, please note that the templates uses many images hosted by Amanda, and when you download her templates, included also will be the images. This is like implying that you should upload those images to the web yourself, get the URL's and substitute them in the relevant parts of the templates. This may be because she don't want you to increase the bandwidth load from her site. In any case, it is probably wise for you to upload the images yourself as then these images will be controlled by you and not Amanda. If Amanda remove the images from the web or her site goes offline, the images in your blog will disappear. Amanda's templates have some features very much different from the other templates including a Lable (category or tag) List in the form of a Label Cloud, animated or fixed gif images, widgets to add a mp3 music player plus a mp3 music file, search box, etc. However, I have noticed that after downloading her templates, some don't include the images (Blues) and some have some missing images. However, this is no problem as I will show you how to get the images, upload them to the web, get the URL's and substitute these with the the relevant URL's in the template. If you want to depend on Amanda, you can skip all those explanation, just download, backup your current template PLUS the Page Elements, upload her template and just forget about the rest. However, she has indicated that she prefer you to host your own files and images. If you want control over the images yourself and you don't know how, then you will have to read my instructions on how to get the missing images, upload the neccessary images and files plus get their URL's. I will start with one of her template and explain the process fully, and the others, if you want to use them, the instructions for the first template will be exactly the same. An example of a blog using this template is Medical Matters. You can download it from Download "Sweet Dreams" 3 column template (zip file). Save the zip file into a suitable folder, perhaps called "BloggerBuster Sweet Dream template" or something. After you downloaded and unzipped the file, you will get 3 column Sweet Dream xml template (highlighted with a red rectangle), a HTML file which when clicked on opens a webpage giving some instructions, an image folder, a music folder, a widger_code folder, and an xml template folder. Refer to Backup and change New Blogger template. If you have already done some customizations (add Page Elements, etc.) edit the Page Elements one by one, paste them into Notepad files and save them into the same folder as some of the Page Elements will be deleted or become empty after you change to the new template. Click the TEMPLATE tab, then the EDIT HTML sub-tab to open the template editor. Click "Browser" and browser to the xml template highlighted with a red rectangle in the screenshot above. Click "Upload". You may get a message that some Page Elements (widgets) will get deleted. Go ahead and upload. When in Window Explorer, I click on the zip file, then a "Sweet_Dream" folder, I can get to the folders plus HTML and xml files as shown in the first screenshot above. However, when I click "Browse" to upload the template and and click on the zip file to get to the folders plus HTML and xml files, the zip file got loaded into the "browse" window instead. So I was forced to open Windows Explorer, went to the folder containing the folders and HTML and xml files shown in the screenshot above and drag them into the folder above. If you faced this problem, this is what you may need to do. I don't know why I didn't have this problem the first time I did it. So I go into the template, look for all the url that ends with star1.gif, replaced it with my own URL wherever I find it. This is repeated for other images. When it is done, preview the template, and if everything seems fine, click "Save template". Now you have the images hosted and controlled by yourself instead of Amanda. If you don't want the bother, you can use my images URL's for your template, but it will mean you are dependent on me. If my post goes offline, your images will disappear. This is something I frequently do and sometimes I get questions where I have to request for screenshots, so might as well make a post in detail on making and editing screenshots. To take a screenshot of the computer screen, press the "Print Screen" (Print Scrn|Sys Rq) key on your keyboard. This will copy the image into your clipboard. I like to use Irfanview (click BACK button to get back to this page). It is free, lots of features and very good. However, the creator of the program do accept voluntary donations. If you want that, just type or copy-paste "irfanview" into the search box above, tick the WEB radio button and search. You will find lots of sites to download Irfanview. 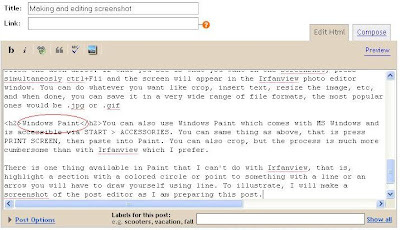 Once you have Irfanview in your program, open the program, click EDIT > PASTE in the menu bar at the top and the screenshot will be pasted into the photo editor window. If you want only a specific section of the screen, click and drag your mouse around the section. The section will be surrounded by a black box. Then click EDIT > CROP SELECTION in the menu bar and the section will be cropped. Then click FILE > SAVE AS.... and save it into a suitable folder in your computer. I normally save this in a folder I named "Temporary". You can also use Windows Paint which comes with MS Windows and is accessible via START > ACCESSORIES. You can same thing as above, that is press PRINT SCREEN, then paste into Paint. You can also crop, but the process is much more cumbersome than with Irfanview which I prefer. There is one thing available in Paint that I can't do with Irfanview, that is, highlight a section with a colored circle or point to something with a line or an arrow you will have to draw yourself using line. To illustrate, I will make a screenshot of the post editor as I am preparing this post. then clicking, drag and let go to draw the ellipse around the word "Windows Paint". The file was saved in the .jpg format, reopened in Irfanview, the section I want cropped, saved again and uploaded into this post. I have previously published a post with a poll Should links to external sites open in new windows/tabs? (click BACK button to get back to this page) which also described how you can make your own poll. However, when I checked, I see to my disappointment that the poll had been closed, contrary to my wish and there is not even a link to see the result of the poll (bad, see screenshot). Also, the new Polls Page Element (widget) which just came out of beta (Blogger in Draft) is not working, so we need an alternative. I am now trying to see if there might be a better alternative free poll. I have done another poll at Poll: Is the world round or flat? Has important implications on Malaysia. This poll was generated at pollcode.com and it looks like you can type your questions and have as many choices of answers as you want (I don't see any limit). I also don't see a provision for a date to close the poll, which is what I want, as I want my poll to not have a closing date and end up replaced with what you see in the screenshot above. You can change font and font color, background color and there is also a box to tick if you want respondent to be able to leave comments. I will have to make a note to check if the poll generated ever go out of date with not provision to see the results. Let's hope Blogger is working on the problem. Never had that problem before. UPDATE 12 November 2007: You can now sign into blogger.com with Opera. Got a not so polite comment from a blogger in my post Why you should be using more than one browser. I seldom use Opera since I have 4 browsers, and have plenty of choices. I normally have 3 opened simultaneously, but seldom use Opera as that 3 is sufficient for my use. Anyway, after that blogger's comment, I decided to check this post and also tried to sign into Blogger with Opera again. I found that after signing in, you don't get automatically logged into Dashboard, but have to click a link "click here to continue". That blogger said Opera is now up to 9.5 now, but my version is 9.24. Contacted that blogger, and now waiting to see if he respond before I update this post further. 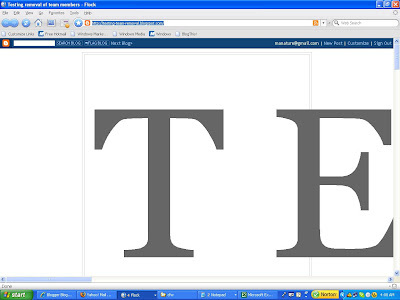 Most bloggers will already now that there is a new Page Element which just come out of beta (Blogger in Draft). A lot of bloggers seem to have problem with it, some reporting getting messages like ""Oops... Polls are currently not available, please come back later." Some got worst problems. They can't edit it or delete it. I personally testing adding a Poll, and it worked fine. I am using FireFox (it is always good to give as much information, example, browser your are using, as you can when you have a problem and is asking for help). You may have a different title="" depending on the question you are asking, plus if you have more than one poll, you may see id='Poll2' instead. Delete this or these widgets and you should be OK. In the meantime, you just have to wait for Blogger to solve the problem. They are aware that there is a problem with some bloggers, although I am the lucky few who didn't encounter any problem. Udate 9 August 2007: This update should have come earlier, but was reminded by a reader that my poll is not working but hers is working fine. I don't know if I will have a problem deleting it from the LAYOUT as some reported and have to resort to going into the actual template, but I think I will just leave it as it is as Blogger said they are working on the problem. Just hope it don't take long as I really want to know how many of my visitors are irritated by me making links to external sites open in new window/tab. I myself is not troubled as I prefer to have the original site intact and just close new window/tab if I don't want it anymore. It will not be easy, but from feedback, bloggers have got helped, one within a day of getting through to Blogger support. I have ignored error messages before and tried again AND succeeded. Other thing you can try - use a different browser. It may or may not help depending on the cause, but that has helped me through many diffferent difficulties. Once you have the browsers in your computer it is very easy to do. Others have recommended clearing cache and cookies, Me, I prefer to do that when I chose and not when I am forced to, to leave that as a last resort because clearing cache and cookies means you have to start a lot of thing from scratch and some pages may take longer to load. Once you have extra browsers installed, it is a very simple matter to use a different browser.